Beau Thiffault and Keith Hennig of ArborPro, a program that manages green space. They see their product as a way to help homeowners’ associations reduce their water consumption by selective watering. A company providing high-tech solutions for water management is ArborPro. When the redwood trees at Caltech in Pasadena began dying, plagued by insects that thrive in the drought, the university turned to the Yorba Linda-based company. ArborPro makes software that tracks and plots trees to visually illustrate where the water-thirsty ones lie and how many are in a given area. This aids in planning the look of a campus or city. More of the business’s current customers, including universities and cemeteries, are buying ArborPro’s retooled turf management software so they can strategically map where they want to cut grass out of the landscape instead of letting lawns turn brown. In January of 2018, Southwestern College, called ArborPro interested in a GPS tree inventory for their campus. 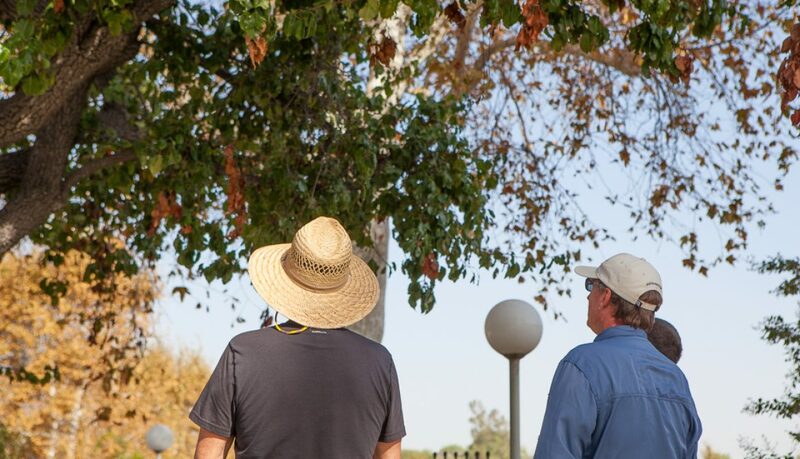 After an online demonstration of the ArborPro software and methodology, Southwestern College decided to move forward working with ArborPro to conduct the tree inventory of their campus forest. ArborPro had recently performed a tree inventory for UCSD, and at the time we were conducting an inventory for the City of San Diego. ArborPro presented local references to the Southwestern College convincing the committee that ArborPro would be the best here solution for managing the campus forest. On March 26, 2018, ArborPro, Inc. began operations on a comprehensive GPS inventory of campus trees at Southwestern University. ArborPro assigned an ISA Certified Arborist to collect detailed information on the condition, size, species, maintenance recommendations, etc. for all trees on campus. We inventoried a total of 1,327 trees over the course of the survey and found that 90% of the trees were in good condition. We also found the Southwestern College campus forest to be diverse with 151 unique species. ArborPro used the i-Tree Streets application to quantify the benefits provided by Southwestern College’s trees. This application uses growth and benefit models designed around predominant urban trees to calculate the specific benefits that trees provide in dollar amounts. The benefits calculated by i-Tree Streets include energy conservation, air quality improvements, carbon dioxide (CO2) reduction, stormwater control, and aesthetic/other. It creates annual benefit reports that demonstrate the value urban trees provide to the surrounding community. The trees on Southwestern College’s campus provide a total of $180,757 in annual benefits. The total replacement cost for all campus trees is $ 6,968,696. 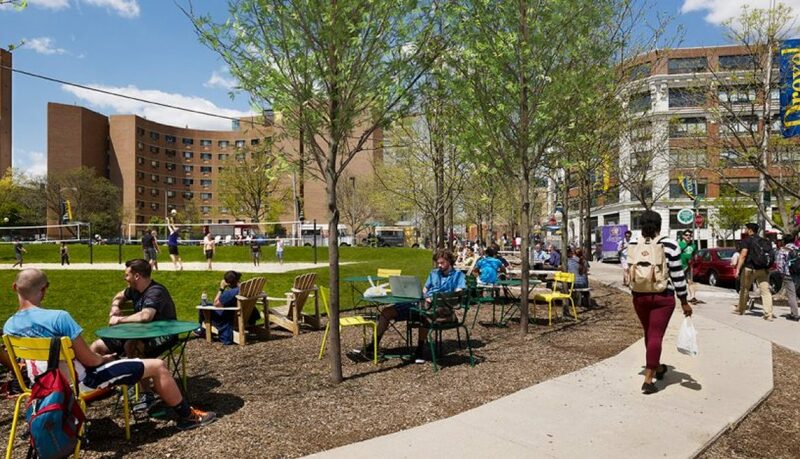 Public trees contribute to energy conservation by providing shade that reduces cooling costs in the summer and diverting wind to reduce heating costs in the winter. The savings in electricity and natural gas are converted into monetary values to illustrate the annual energy savings that trees provide. 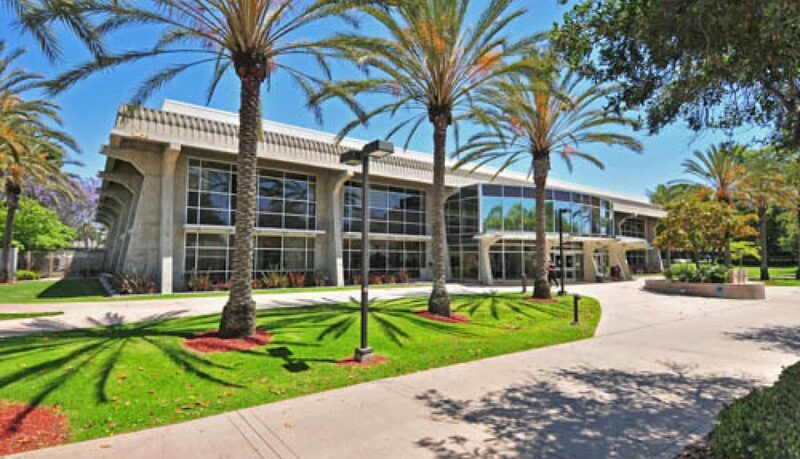 Southwestern College’s trees account for a savings of $12,093 in energy consumption each year. Trees improve air quality by removing pollutants from the atmosphere, including ozone, nitrogen dioxide, and particulate matter. The estimated value of pollutants removed by the inventoried tree population each year is $30,100. Trees reduce the costs associated with diverting stormwater by intercepting rainfall before it hits the ground and enters the storm runoff system. Intercepting rainfall greatly reduces the strain placed on public stormwater runoff systems and can represent significant monetary savings by reducing the amount of infrastructure needed to divert stormwater throughout the campus. The estimated savings for the College in the management of stormwater runoff is $1,643 annually. Trees provide many social and economic benefits that are classified as aesthetic/other in the i-Tree Streets application. The major economic benefit in this category is increased property values. Trees contribute to higher property values when compared to similar properties that do not have trees. The major social benefits provided by trees are lower crime rates, improved mental health, greater time spent in businesses with tree-lined streets, and higher productivity in the workplace when a view of nature is available. The inventoried trees contribute $134,139 annually in aesthetic/other benefits. In addition to Environmental Benefits, the college can consider the Total Replacement Value for its urban forest. Total Replacement Value is the amount of money it would take to completely replace the existing urban forest with trees of the same size. While this is a scenario that will likely never happen, it gives the City a specific dollar value of its trees in their current state. Replacement value differs from Environmental Benefits in that it shows how much the trees are worth instead of the dollar values that they provide in benefits. For example, a mature sugar maple could provide $2,100 in environmental benefits by reducing stormwater runoff, improving air quality, etc. but the total cost of replacing an 18” DBH sugar maple would be $24,270. According to i-Tree Streets, the total replacement cost Southwestern College’s trees is $ 6,968,696. After experiencing the benefits and functionality of ArborPro, Southwestern College has decided to purchase ArborPro’s Turf & Asset module. With Turf and Asset, Southwestern College will be able to manage all their assets like signage, fire hydrants, emergency call boxes, picnic tables, water fountains, backflow valves and more. ArborPro will begin Southwestern College’s asset inventory in the following months. Drexel University’s Operations and Maintenance Department chose to complete a GPS tree inventory & assessment with the urban forest management firm ArborPro, Inc. The arborist from ArborPro performed a ground assessment of each tree throughout the campuses 96 acres. The GPS tree inventory & assessment took one week. The University now uses ArborPro’s Cloud-based Tree Management System to record maintenance, take photos, and run reports of the campus urban forest. On March 19, 2018, ArborPro, Inc. began operations on a comprehensive GPS inventory of campus trees at Drexel University. ArborPro assigned an ISA Certified Arborist to collect detailed information on the condition, size, species, maintenance recommendations, etc. for all trees on campus. ArborPro inventoried a total of 980 trees over the course of the survey and found that 98.1% of the trees were in good to fair condition. We also found the Drexel University campus forest to be diverse with 66 unique species. The top ten species on the campus are; Thornless Honey Locust, Red Maple, Japanese Flowering Cherry, Sawleaf Zelkova, American Sycamore, Hybrid Elm, Red Oak, Downy Serviceberry, Eastern Dogwood and Eastern Redbud. ArborPro completed the survey March 23, 2018, and delivered the inventory in the ArborPro cloud-based tree management system, Enterprise. ArborPro Enterprise utilizes the latest in GIS (Geographic Information System) technology to provide the user with an immediate visual representation of any tree in their campus urban forest. The ArborPro Tree Inventory Software Suite is rich with features including Work Order Management and Call Manager. This secure online system will allow Drexel University to access, plot, search, query, record maintenance records and update your tree inventory on any web-enabled device. All functions of our easy to use comprehensive tree inventory and management software is updated instantly, to the cloud. Drexel University purchased a 2-user license of ArborPro’s Enterprise Edition to maintain the university’s campus forest continually. Central Florida is a region often characterized by suburban sprawl, tourism, and a rapidly growing population. Yet adjacent to these areas of dense human development exists a blend of ecosystems that continues to support a variety of wildlife. Nestled at the heart of all this lies the University of Central Florida, a campus that boasts almost 800 acres of natural lands. It’s UCF’s urban forestry team that’s responsible for the maintenance of these lands, and on February 5th they received recognition from the Florida Urban Forestry Council for their commitment to conservation. The Urban Forestry Program at UCF was first established in 2010 as a means of responding to storm damage. Since then, the five-person team has overseen the planting, pruning, and removal of UCF’s campus trees—all 7,756 of them. 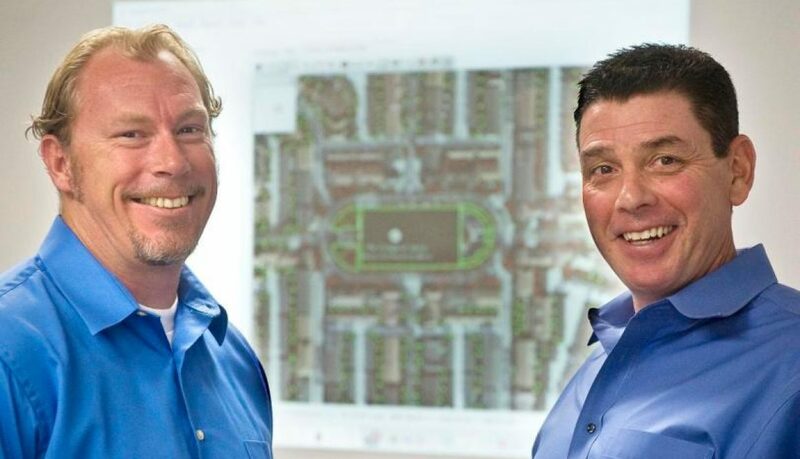 Using Arbor Pro, a GIS mapping software program, the team is able to keep a tree inventory, place work orders, and manage fertilizing needs using a web-based interface. UCF is the first university to ever receive this recognition from the council. John Guziejka-a biologist and arborist on the UCF team-believes that as the campus population continues to grow, the need for a robust urban forestry program is more important than ever. According to Guziejka, trees offer a variety of services. They provide wildlife habitats, aesthetic enhancements, water filtration, recreational opportunities, and are even linked to improved mental health. Trees also release oxygen and store atmospheric carbon dioxide through a process known as carbon sequestration. In 2017, the trees at UCF sequestered about 97 tons of carbon, which not only helps to mitigate climate change, but also supports UCF’s climate action goal to be carbon neutral by 2050. 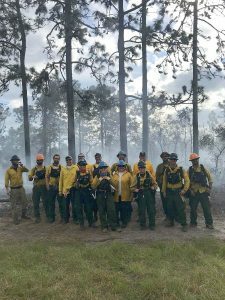 One of the most notable aspects of UCF’s urban forestry program is its prescribed burning initiative. These prescribed burns occur frequently on campus, and have proven to be beneficial to the native plant communities. “These are low nutrient systems, so burning them acts as sort of like a fertilizer” Guziejka said. “These prescribed burns also open up mid-story vegetation, remove invasive species that aren’t accustomed to fire, and reduce the risk of future wildfires through fuel reduction”. Since starting prescribed burns on campus several years ago, the UCF natural lands have made impressive strides in biodiversity. These lands now provide habitats to gopher tortoises, hawks, osprey, deer, songbirds, and even a black bear. Student engagement is also a priority for the urban forestry team, and they frequently partner with the Arboretum. Together, they plan to increase tree signage, establish trails, and even strategically place trees that allow students to better hang hammocks. “I encourage students to look up” Guziejka said. “We should take the time to appreciate our access to these natural lands”. Jeff Davidson from ArborPro points out an Evergreen Pear (Pyrus Kawakamii) infected with Fire Blight. Fire Blight is caused by the bacterium Erwinia amylovora and is a frequently common destructive disease of some fruit trees and related plants. Pear (Pyrus species) and quince (Cydonia) are extremely susceptible to Fire Blight. Apple, crabapple (Malus species), and firethorns (Pyracantha species) also are frequently damaged. 1. To treat Fire Blight, first put on gloves to protect your hands from the bleach. 2. Measure 4 cups of water and pour it into a large bowl. Add one cup of bleach to the bowl and stir the contents with a spoon. 3. Prune all branches with fire blight off with shears. Dip the shears in the bleach solution after each cut so as not to spread the infection. Cut off all branches at least 12 inches below the last branch that is wilted and discolored. Dispose of the branches in an area that is at least 100 feet away from the tree. 4. Open a 1-gallon garden sprayer by turning the lid counter clockwise. Pour in 6 cups of water and then 4 cups of white vinegar. Close the lid in a clockwise direction. Shake the sprayer gently to mix the contents. Pump the handle on the top of the sprayer to pressurize the contents. 5. Put on safety glasses. Point the nozzle at your tree and depress the lever on the wand to spray the tree from bottom to top and underneath the leaves. Next, step back from the tree and spray the vinegar solution from top to bottom until the leaves are dripping. Spray the tree trunk thoroughly. 6. Spray the vinegar solution on the fruit tree again in two weeks to ensure the fire blight well treated. Get high quality writing assistance fast, find original site where you can pay to write a research paper. Professional writers are always ready to provide plagiarism-free papaers and ready to meet any deadline. • Control aphids and insects that spread fire blight on your trees. • High nitrogen fertilizers encourage new lush growth that attracts fire blight bacteria. • Remove dead leaves and plant debris at the base of fruit trees. Fungal spores thrive in dead matter. Place organic mulch around the bottom of fruit trees to keep any fungal spores from splashing up on your tree in heavy rains or when watering them. The City of Venice conducted its first tree inventory study with the aid of the Florida Urban and Community Forestry Grant Program, funded by the U.S. Forest Service, during the summer of 2017. These funds were made available to organizations and municipalities to develop or enhance their urban and community forestry programs. With the $10,000 grant, and $10,000 of city funds, the city was able to hire the experienced and well-respected firm ArborPro get a precise count and condition assessment of every tree in 33 city parks and about a quarter of the trees on other city properties and rights of way. 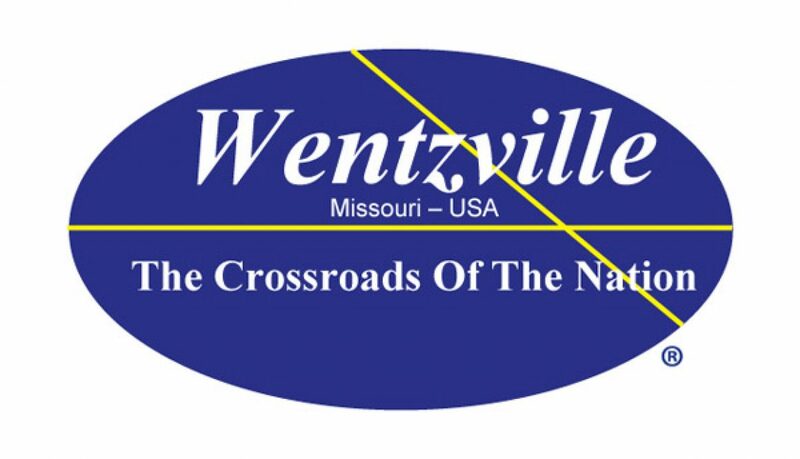 It is expected that the city will apply for an additional grant to complete the survey in fiscal year 2019. The survey counted 7,201 trees, 40% of which were 12 inches or greater in diameter. Of these trees 74% measured 15 feet or taller. From a health standpoint, the assessment found that about 88% of the trees were in fair, good or excellent condition. Only 70 trees were recommended to be removed because of defects making them potentially hazardous. City staff will work on recommended pruning and removal of hazardous trees in the coming year. The inventory and related software program will allow Venice to more easily maintain its substantial investment in trees, identify areas in need of additional trees and develop a robust tree-planting program. For more information, please contact city Public Works Director John Veneziano at 941-882-7359 or jveneziano@venicegov.com. While high-quality roads, appealing architecture and effective public transportation have long been seen as catalysts of economic growth, policymakers have paid little attention to industrial infrastructure’s arboreal counterpart: trees. The Urban Forest Map — a visualization of every tree in San Francisco — seeks to change that. It turns out that trees too have economic and environmental benefits via their capacity to conserve energy, filter stormwater, capture air pollutants and remove carbon dioxide from the environment. With the help of local nonprofit Friends of the Urban Forest and tree inventory specialists ArborPro and Davey, the city calculated and mapped the economic and environmental value of each tree in the city in order to remind policymakers and residents alike of these often-overlooked benefits. The city deployed a team of certified arborists in January 2016, and one year later, the team had identified the exact location, species and current condition of 124,795 street trees — more than 20,000 above previous estimates — as well as 40,000 vacant sites for future plantings. The Urban Forest Map relies on crowdsourcing to fill in any gaps in the data collected by the city, allowing users to add new trees as well as document stewardship activities like watering or pruning. And, as a means of appealing to residents on a more personal level, each tree also has its own Web page, and users are encouraged to upload photos to help tell trees’ stories. The map shows that San Francisco’s trees provide significant value to the city. Drawing on the expertise of ArborPro and Davey, the city was able to estimate the energy conserved, stormwater filtered, air quality improved, carbon dioxide removed, and carbon dioxide stored by each tree, which the city then aggregated in a rating of total annual benefits in terms of dollars saved. Taken together, the city’s arboreal infrastructure saves more than $2.3 million per year, conserves more than 12 million kWh/year of energy, filters more than 100 million gallons of water, improves air quality by 55,000 pounds per year, removes 19 million pounds per year of carbon dioxide, and stores 77 million pounds of carbon dioxide. By comparison, the average American home consumes around 11,000 kWh per year of energy, and the average car emits around 10,000 pounds of carbon dioxide each year. 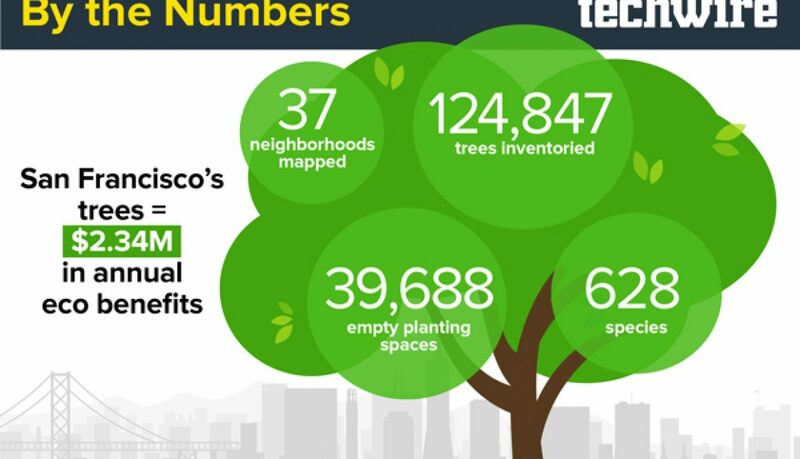 Thanks to this visualization, San Francisco policymakers and residents are more aware of the value of the city’s trees and can make more informed conservation efforts. The Urban Forest Map comes at a critical time for San Francisco’s arboreal assets following the passage of Proposition E in November 2016, which transferred street tree maintenance responsibility from private property owners to the Department of Public Works (DPW). Using the map, DPW employees can better track the location and condition of the city’s trees, improve their tree and sidewalk maintenance, and promote public stewardship of the city’s urban forest. Similarly, the Los Angeles County Department of Parks and Recreation, under the leadership of CIO Mohammed Al-Rawi, has turned to tech as a means of preserving and better using that sprawling county’s parks and forests. — Story by Chris Bousquet of Data-Smart City Solutions, an initiative of the Harvard Kennedy School, with additional reporting by Techwire. A version of this story previously appeared in Government Technology.